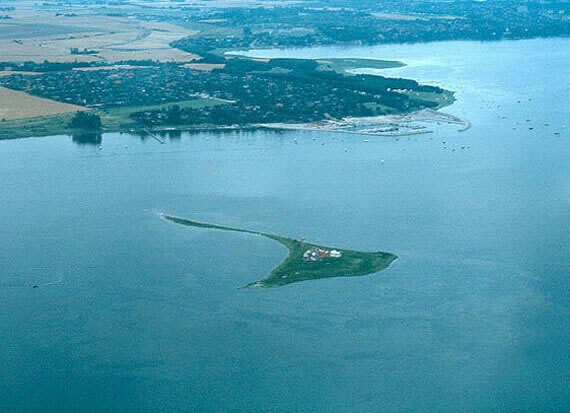 This is a small island (roughly triangular in shape, each side being approximately 400 meters in length) located deep in Denmark's Roskilde Fjord. It is in the east coast of Denmark. The journey from Roskilde takes 17 minutes by rowboat. The Kingdom was born on August 27, 1944, after a group of professors / school teachers, under the leadership of Hans Neerbek, purchased the island for use as a summer camp. They proclaimed the island's tongue-in-cheek "independence" as a Kingdom as a gentle parody of the government structure and royal traditions of Denmark. Capital: Maglelille. Language: Interlingua (an international language along the lines of Esperanto, but based on Latin). Camping is the only option. There’s no electricity or water on the island. Prior to 1944 the island was known mainly as the location at which the early Nordisk Film, Løvejagten på Elleore was shot, in 1907. In 1962, a form of Neo-Latin called Interlingua became their official tongue (Neerbek had founded the Danish Interlingua Union in 1960). Although little known outside Scandinavia it is one of the longest-lived micronations of the modern era. Their location is approximately 55°41'10"N and 12°03'40"E and comprises a claimed area of 15,000 sq meters. Numerous traditions peculiar to the kingdom have evolved over the subsequent decades, including a ban on the novel Robinson Crusoe, and the use of "Elleore Standard Time", which is 12 minutes ahead of Danish time. Many of the place names on the island, the kingdom's "government" and the titles assumed by its "nobility" are parodies of Danish equivalents. They purported organizational structure constitutional monarchy. The island is flat with small hills, a lake and a little forest. Birds are the only permanent inhabitants (including a large colony of Mute Swans and a Herring Gull colony) and the national animal is a lion, a creature that holds a very special place in Elleorian lore. Roskilde Fjord is in fact a bird reserve, which is why the Danish authorities ordered the Elleorians to destroy their castle in 1958 in order to minimize human intervention on Elleore. Elleore is unoccupied save for a week-long annual gathering attended by dozens of "citizens" and known as the "Elleuge" (meaning Elle-week). The ceremonial enthronement of the reigning monarch takes place at this time. The kingdom has issued numerous stamps and coins. 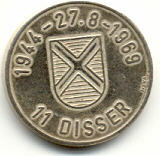 The silver 11 Disser coin minted in 1969 is believed to be the first precious metal coin produced by a micronation, pre-dating a 1970 release by the libertarian Atlantis project. 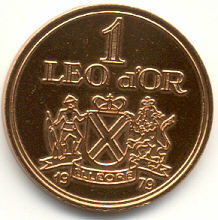 It has periodically minted coins since 1969. 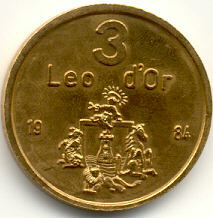 They introduced Leo D'or as their currency since 1979. The island's only permanent residents are birds; it is uninhabited by people for 51 weeks of the year, but during seven days in July, citizens are permitted to visit and go camping there. Their Motto is "Let us help one another" and Anthem is "Ave nostre patria". 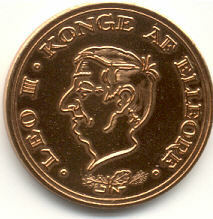 Their first coin seems to have been a “Regno de Elloria” 11 Disser piece dated 1969. In addition, there's a 1979 1 Leo d'Or, a 1983 2 Leo d'Or, a 1984 3 Leo d'Or and a 2003 2 Leo d'Or. 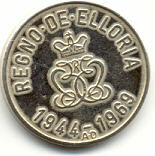 Elleore, which once claimed to be the “world’s smallest Kingdom”, has also issued many postage stamps over the decades. Their first king Erik I, whose motto was ‘Let us help one another’. Each subsequent king has had their own motto, including King Leo the 1st (’Seriousness and Merriment’); Erik the 2nd (’Faith above Trust’); Leo the 2nd (’Hope to the Sea’); and the current King Leo the 3rd (’With Lion and People for the Kingdom’). Erik the 2nd’s wife, by the way, was known as Queen Lilian the Happy One, leading one to wonder whether Monty Python took Elleore as their inspiration for their ‘Happy Valley’ episode (you know, the one with the happy Princess with the Wooden Teeth). 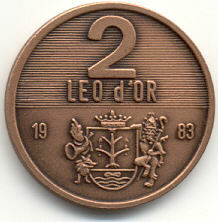 There appears to be some controversy surrounding the 1983 coin that features a king identified as Leo III. 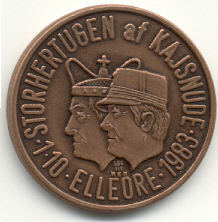 According to Prime Minister Nielsen, it displays the double profile of the Grand Duke of Kajsnude, who was "crowned for one day" in 1983, and reigned as King Os I, although the coronation was only considered symbolic, and he is not officially listed as a King of Elleore. 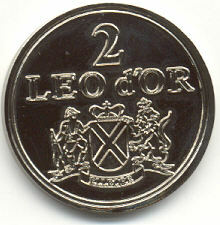 Mr Nielsen states that the coin was prepared in advance of the coronation, and that the use of the name Leo III was a mistake. 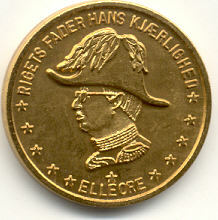 The man featured is Hans Neerbek, the founder of the Kingdom of Elleore, who is known as "His Grace the Archduke of Nør Len". 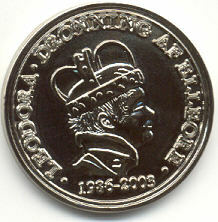 The Danish inscription on this coin translates as "Father of the Kingdom, Our Beloved". The Archduke was the brother of Leo II, but never reigned as king himself. I purchased all the above coins from Oded Paz. The ruins of Krune Monastery, or the large stone that was laid when the monks first landed; it’s inscribed with the legend, ‘Hic est locum’ (’This is the place’). Elleorians call the stone ‘Anstødsstenen’ (’The Stumbling Block’) and today it’s been moved slightly to the south of its original location. There’s a museum in Jyllinge, near Roskilde, that contains Elleorian relics. The ’state’ boats Elfin and Sealion make the journey during Elleorian Week. Note that while only Elleorians have permission to camp on the island, it’s forbidden for anyone to land on any of the fjord islands during the bird-breeding period (from April 1 until July 15). At any other time Elleore is private property. You might try asking for an appointment to visit, but this is rarely granted to non-Elleorians. If you just want to take a look at the Kingdom, try the Sagafjord boat (www.sagafjord.dk; adult/child DKK89/39), which traverses up and down the fjord – twice past Elleore. During Elleorian Week the islanders salute the boat and the boat salutes them with gunshots. Mind your head. The other way to visit is to take out citizenship, and that can be done one of two ways. For the first you’ll need to be 12 and enrolled at Kildegaard School (one of the original schools founded by the Immortals); all Kildegaard 12-year-olds are given the chance to enrol in the Land Forces’ Under-graduation Course, effectively an introduction course to Elleorian culture. After that the pupils can decide whether to become citizens or not. The second way is a bit more accessible: you’ll need to be recommended by at least two citizens. • A Kingdom of No Comparison (1991). This book took ‘17 years and three computer systems to finalize’ and features pictures and essays written by prominent Elleorians.